It had been awhile since we came across a toy that was really different. Then, when we weren’t even looking, we saw the Seamsters Puzzle Toy. "What a cool idea", I thought. It came in a basket with some other toys and treats that we got at a fundraiser for a local animal shelter. This toy was the centerpiece of the basket and it definitely looked the most interesting. This rawhide and rubber dog toy is made by Kyjen. 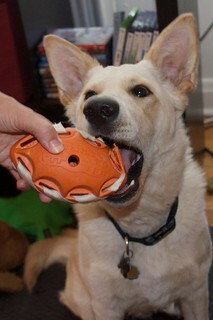 It’s a football shaped rubber treat holder with slits along the edges that you can weave rawhide into. It even came with an extra lace of rawhide for its second use. Advertised as a "Rewarding long-lasting boredom buster", this toy promises to "stand up to the toughest chewers", "clean teeth and strengthen gums", and it is "restitchable for repeatable fun". Much like the last puzzle toy we tried, this just didn’t live up to the hype. There would be no second use. In five minutes, Balki destroyed it and we had to throw it away. He has become quite the chewer, but he definitely isn’t the toughest chewer. Another disappointment.